The Norwegian Geographical Survey (Norges Geografiske Oppmåling) was established in 1773. The first county map was published in 1826. In 1845 the first of three sheets covering the county of Christians (later Oppland) was completed. It was based on observations by Artillery Lieutenant Soren Chr. Gjessing. Sheets two and three were published in 1849 and 1851, respectively. 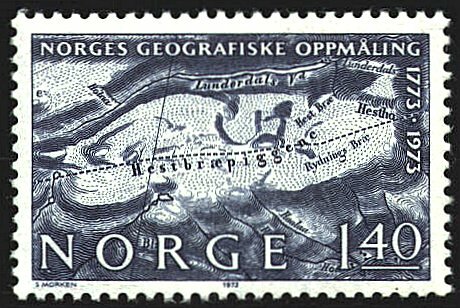 The design on the stamp is derived from the third sheet, and represents a mountainous and glacier-covered area designated Hestbræpiggene. Lieutenant Gjessing compiled the data for the map, and prepared the manuscript maps. The manuscripts were engraved for printing by the Chart Institute in Copenhagen.